Home / Adventure / Asia / Automobiles / product or service reviews / Zoomcar selfdrive Auto- experience driving autorikshaw! Zoomcar selfdrive Auto- experience driving autorikshaw! I've driven wide range of cars ranging from Nano to Landrover, tractor, microlight aeroplane, superbikes, but driving an auto was still pending. About a month ago, self-drive car rental agency Zoomcar announced that it is introducing self-drive autos on pilot basis. Media went berserk, without trying the service, without reading the fine print, major media houses ran stores explaining how revolutionary and cool it is (Read on DNA, Firstpost. Many thought it is just an April fool joke (few companies like Ola had history of announcing crazy service – like helicopter ride for Rs 500, get all the publicity and then declare it as a April Fool Joke). When this news came to my attention, I wasn’t sure how to react. When I read the fine print on Zoomcar blog and it was not at all impressive- it said in an 1 hour rental, some 20-30 minute will be taken for orientation (where we will be explained how to ride an auto) and we are not supposed to go beyond 1km radius and that some of zoomcar staff will be sitting behind. With these many rules and restriction, it was obvious Zoomcar auto self-drive is just a PR exercise and not really a viable transport option like their car rentals. Out of curiosity, I tried booking a self-drive auto on April 1st. But it showed “Not available”. Tried different dates and found that till April 20th it wasn't available. I could book a slot for April 21st. Booking amount for 1 hour Auto rental was only Rs 20, so I decided to take a chance (that it might be a joke) and book it right away. I selected early morning 6.30 to 7.30 AM so that I can finish the ride and go to office. It was full 3 weeks away,so a long wait. I also had to pay Rs 5000 as security deposit, but I had time till previous day to pay that. When I checked on twitter, spotted few pictures and videos of people trying out self-drive auto in various cities. So it wasn’t complete joke and was happening. But next day Zoomcar announced that they have stopped Auto booking due to high demand. I think that is polite way of saying “We are not continuing this pilot for long” (otherwise in their cars division booking is not suspended if a car is not available- it is simply shown as not available and for some future date I will be able to book. But as of now, you can’t book this Zoom self-drive auto any more on their website. I had booked with a location closer home, but 2 weeks later Zoomcar reps call me and say it can be serviced only at Gopalapuram, a location further 10km away. I didn’t have too much choice (other option was to cancel the booking, which would have denied me the auto driving experience), so I agreed. On the day of rental (yesterday), I went to the pickup point, saw two autos parked. They had no Zoomcar branding on them. Called the rep, they came down (Zoomcar staff and real auto driver) and I was taken to Chennai’s Marina beach. Marina beach has an open stretch of few kms length used by morning joggers as well as for vehicle parking. I was only allowed to drive in this stretch and not on the main road. The KT or briefing session lasted 2 minutes- with driver telling me the gear pattern (one up and 3 down similar to a Bajaj Chetak scooter. 3rd minute I was in driver’s seat- put it into gear and started rolling. After a short round, came back, got the driver and zoomcar staff into passenger seat and continued with my drive. Starting the auto- This auto had traditional lever which one needs to rapidly pull upwards. It took me 3-4 attempts to get it started but I managed to start it myself (watch the video). Modern autos come with self-start so this painful exercise can be avoided. (starting the auto using lever so many times a day is said to be harmful for driver’s bones). Modern autos also come with reverse gear, but in the one I was driving, reverse gear was reportedly not working- driver said he didn’t bother fixing it once it broke. Driving the autorikshaw was fun in the beginning. Steering is similar to that of a scooter, you need strong arms to make sharp turns as it tends to recoil a bit. The Auto I drove didn’t have any instruments in working condition, so I don’t know what the top speed I touched is. It has four gears, but even if you are off by a gear, it doesn’t stall and can cooperate. Identifying neutral was tricky as markings have worn off. Driver had twisted the rear view mirrors inwards, so I couldn't even see what is happening behind me, unless I turn my head and check. Otherwise driving was fun. It had adequate power, makes enough noise to get attention and view is great, never mind there is no seatbelt, abs or anything else for safety. 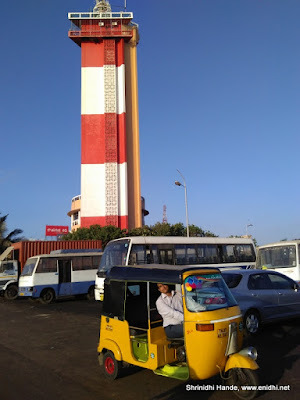 I drove for close to 1 hour, from one end of Marina beach(light house) to other and back. 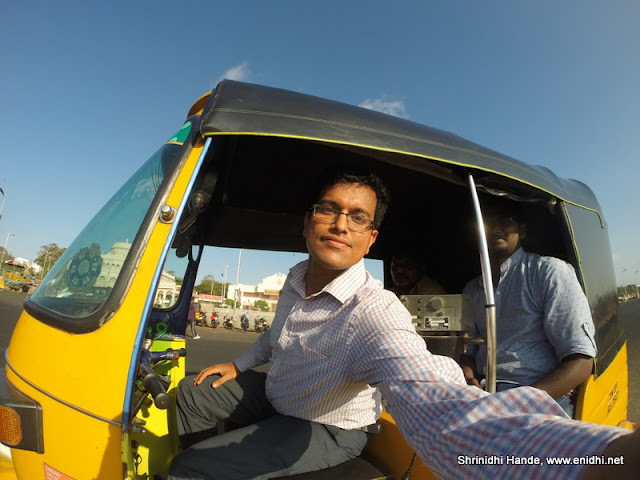 I had fun negotiating different kinds of people in their morning walk, while I was trying to minimize honking and negotiate my way amidst the crowd, driver who was sitting behind was constantly pressurizing me to honk, so as to make people move away from rikshaw’s path. Also stopped at light house for a few pics. I made a 2 min video of my auto drive using GoPro- watch it below or check this link. Most morning walkers didn't notice that someone in full office formals is driving an auto again and again on the service road. May be they thought I am the regular driver who just forgot his uniform. After about an hour, I handed over the controls to the real auto driver, he dropped us back at the pickup point. While I had paid only Rs 20 to Zoomcar for this booking, Zoomcar rep paid about Rs 150-200 to the Auto guy for his one hour service. Clearly Zoom is not making money out this and is just a marketing initiative. Now I need to wait for my Rs 5000 deposit back. If Zoomcar is to launch this service for real, paying 5000 deposit and waiting for a week to get it back won't be practical. They will need better options. Driving a yellow board vehicle needs separate license. This could be one of the reason during this pilot customers are required to drive in specific locations (like service road in Marina). So unless Zoom buys and deploys autos with black and yellow numbers, customers can't rent it and drive themselves like self drive cars, as Auto needs a separate license. You can always buy a private auto. Thanks Zoomcar for facilitating the auto driving experience for just Rs 20. It was great experience. Not sure if I want to do it again if it comes with these restrictions- (drive in a confined area with staff sitting behind), but if they open it up at par with car rentals, I will definitely book for a few days and plan more interesting stuff. Hi Shrinidhi , Special thanks to Zoomcar for facilitating the auto driving experience for just Rs 20. 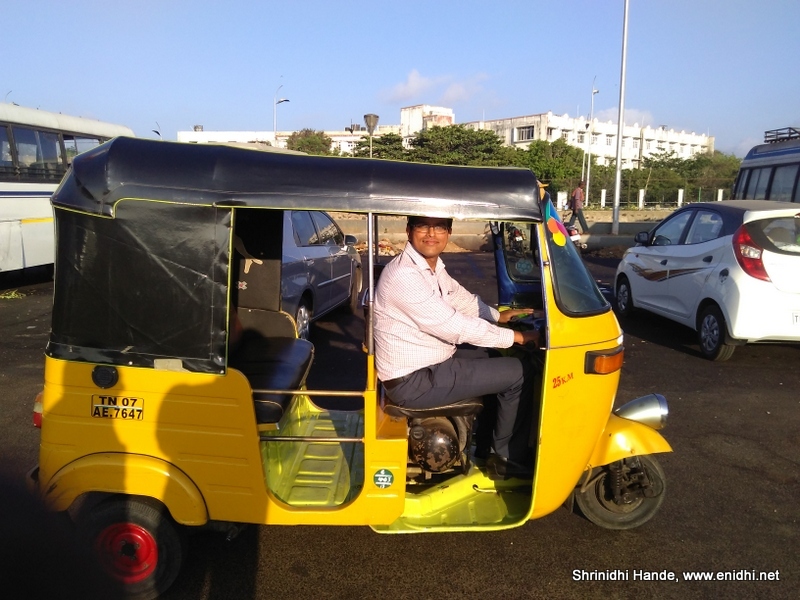 You must have felt really excited to drive an Auto in Namma Chennai. May I request you, I hope, I wish you add some kind of emotional / personal touch to your unique travel stories. May you get more response to this post than you received for the facebook post. Woah.. you actually took the ride! awesome. thanks for sharing this experience. -Refuse your passengers to their destination. -Ask them for higher fare. It would have been nice to see their reaction!